Learn to speak Conversational Spanish or Portuguese and save money at the same time when you take advantage of our Monthly Specials. The language learning programs that we place on sale are for independent learners who enjoy listening to Spanish or Portuguese CDs or MP3 downloads when they are on the go, as well as for those who wish to learn to speak a second language using interactive computer lessons. Whether you are just starting your language learning program or are well into your language studies, the courses on sale expand vocabulary skills, provide practice for memory retention, and augment any language course. Check back often to find the Monthly Special that will boost your Conversational Spanish or Conversational Portuguese skills. Portuguese language learners can now purchase all three of Maria’s Portuguese vocabulary CD programs bundled into one affordable price and available for a limited time ONLY! 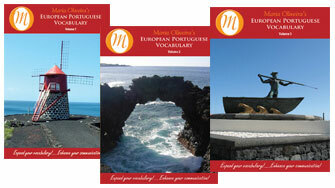 Featuring fifty-seven lessons on three CDs, these programs expand your Portuguese conversational tools with a wide range of subjects. From food to household items, from shopping to medical needs, and so much more, all words are useful for business and social interactions with native European Portuguese speakers. Practice on your own schedule in your car, at home, anywhere! Audio sample! Audio sample! Audio sample! Increase your Conversational Spanish skills by learning Spanish Phrases! Are you ready to make friends and meet new people using your Spanish language skills? 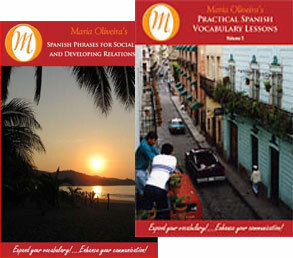 Would you like to impress your friends by using authentic conversational Spanish? This CD will help you accomplish your goal! Twenty lessons cover a wide range of useful topics in 80 minutes of audio material. Expand vocabulary skills with hundreds of new, everyday words. Reference cards are included for visualizing the words.